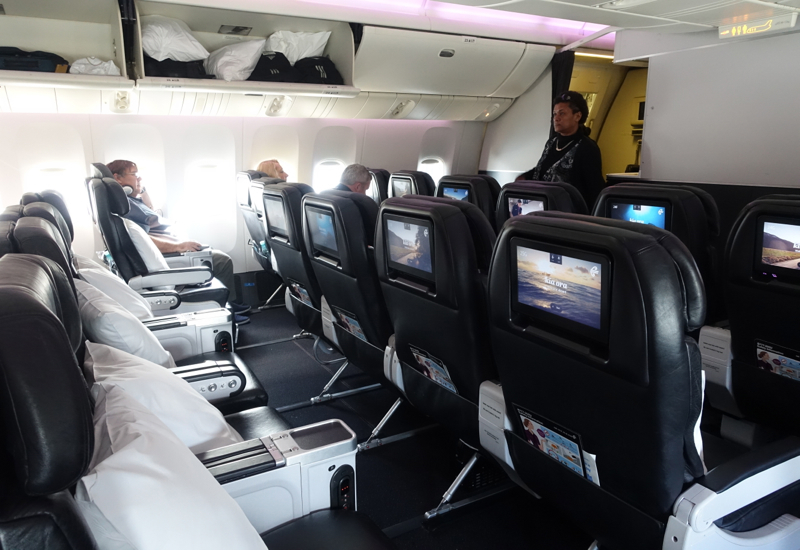 This Review of Air New Zealand Premium Economy on the 777-300 from Auckland to Nadi, Fiji, is from a New Zealand trip report. For all our posts on New Zealand luxury lodges and dining, please see our posts tagged New Zealand. 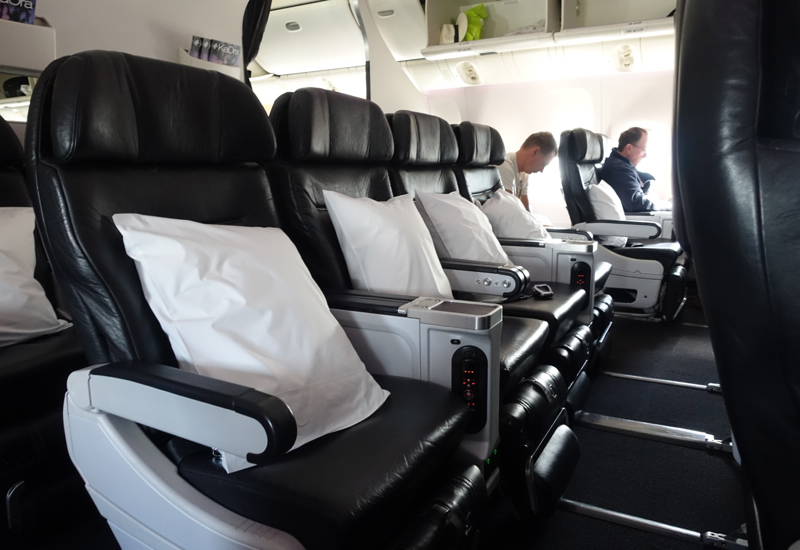 In contrast to my husband's underwhelming experience in Business Premier, our Air New Zealand Premium Economy experience is the best Premium Economy experience I've had to date, although admittedly I don't fly Premium Economy all that often. Best Place to See a Kiwi Bird in the Wild in New Zealand? There were only a handful of other Premium Economy passengers (in fact, I think there were even fewer Premium Economy passengers than there were Business Premier passengers) so no one sat in any of the 4 across. 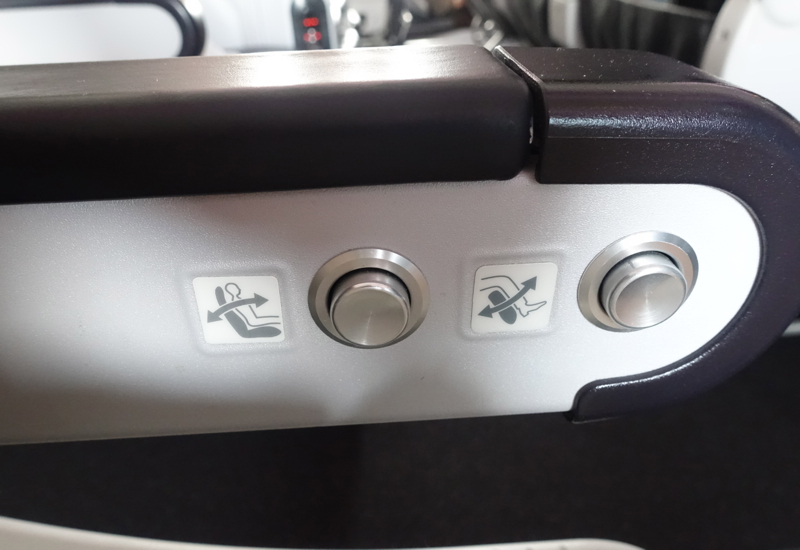 Naturally the window/aisle seats on each side, such as 24A and 24B, 24J and 24K, etc. are the best seats for couples or even for those traveling solo, especially on a flight as empty as ours. On long flights or night flights, I'd avoid the first row, row 23, as it's by the galley so there tends to be more light and noise there. Row 23 also has bassinet seats that may be needed by passengers with infants. 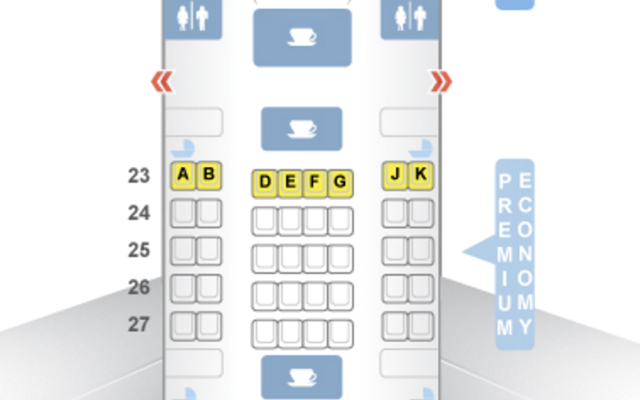 I'd avoid the last row, row 27, for the same reason since there's a galley right behind it. Air New Zealand's Premium Economy Seat on this 777-200ER is a bit wider than regular Economy, at 18.5 inches instead of 17.8 inches. 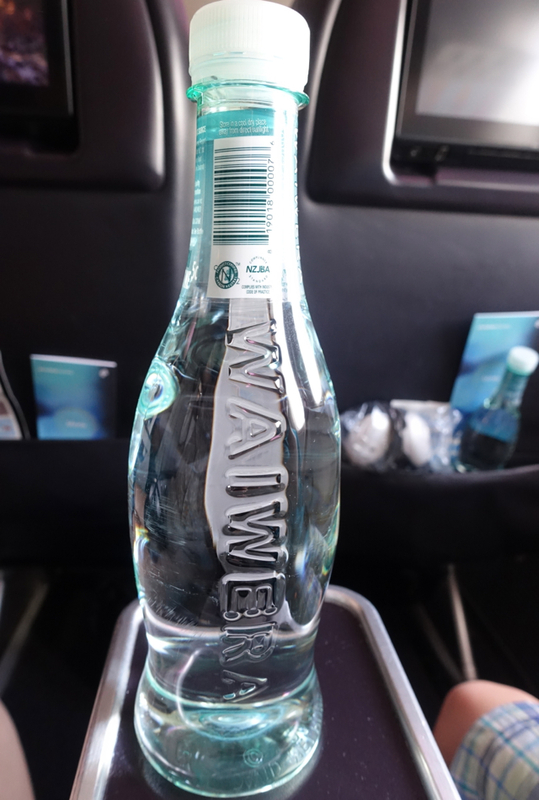 A pillow was on each seat, and there was also Waiwera artesian bottled water in the seatback pocket. Here's a photo of my seat in reclined position, with the foot rest extended. We started out on a great note, thanks to fresh squeezed orange juice. 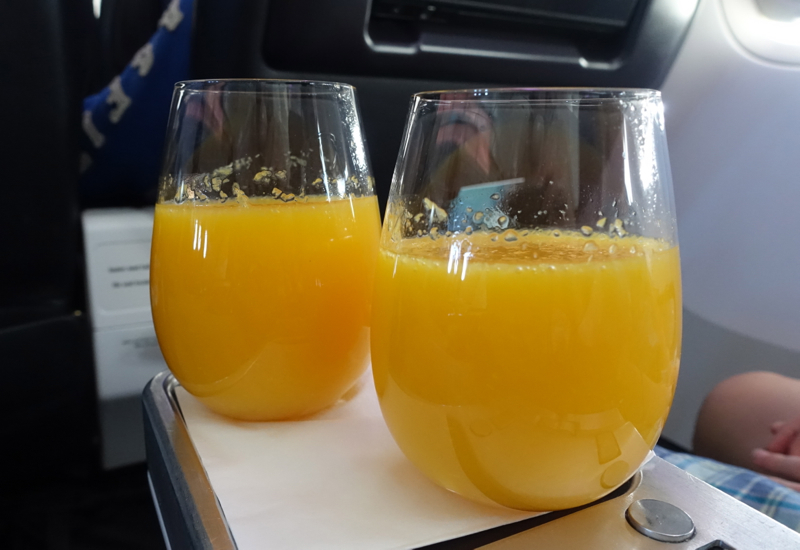 I can count on one hand the number of times I've had fresh squeezed juice (instead of from concentrate) in business class, and having it in Premium Economy was a first. 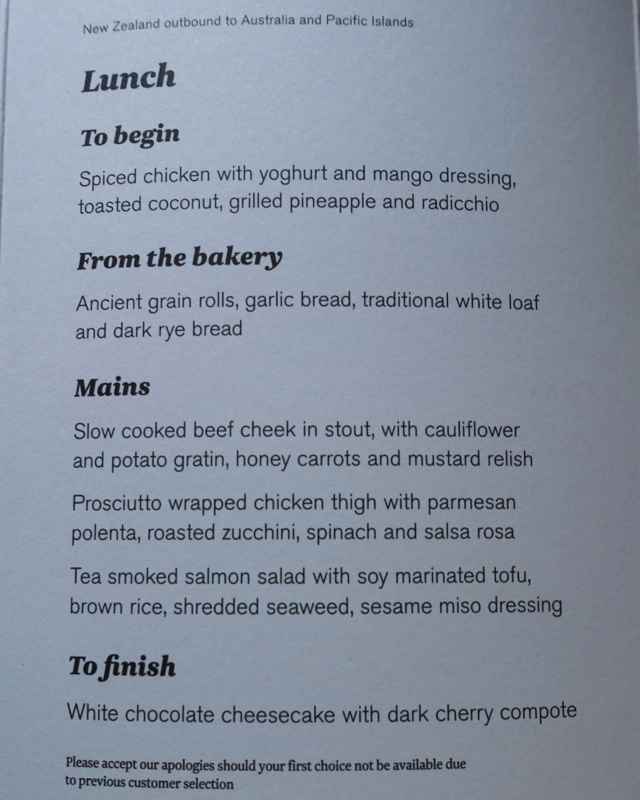 If you read my husband's Business Premier Review, you'll recognize that the lunch main dish choices were exactly the same for him and for us. The only differences were the additional appetizer and dessert choices. 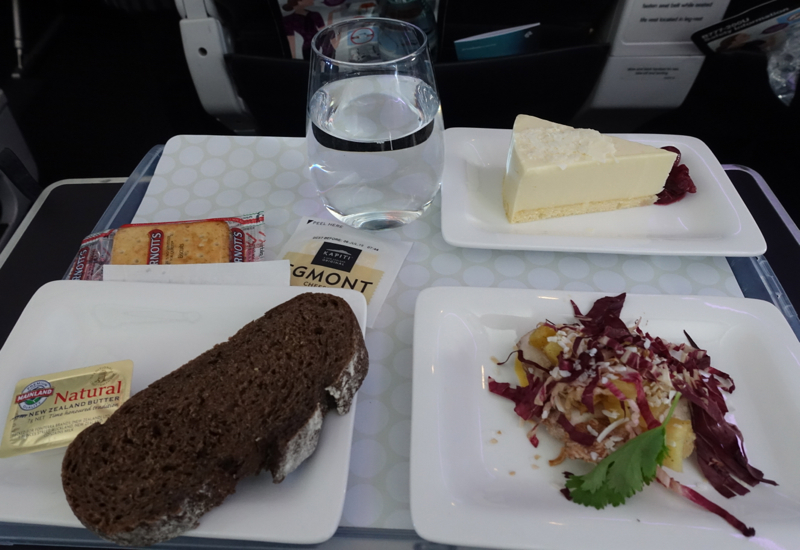 For Premium Economy, we were served with meal trays of course, not with a tray table cloth as in Business Premier. We were though offered a choice of bread from a bread basket, and I was happy to see Pumpernickel. 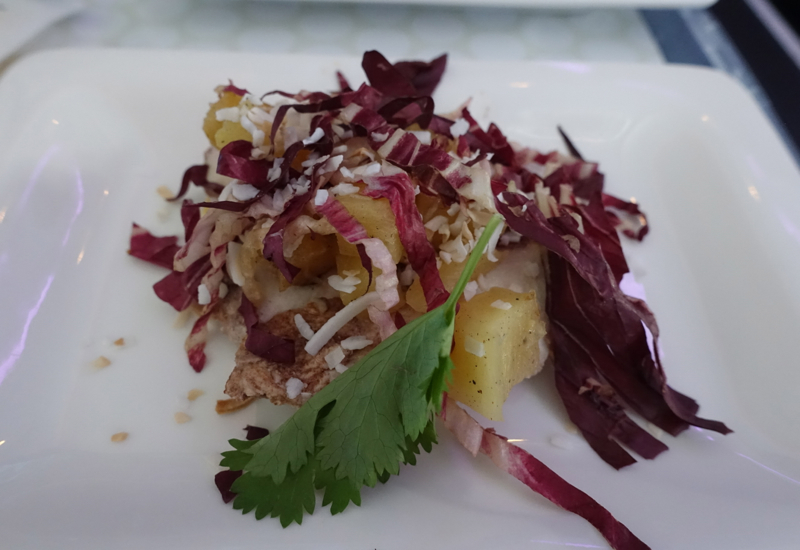 The appetizer of Spiced Chicken with yogurt and mango dressing, grilled pineapple and radicchio was very fresh tasting, but too adventurous for my son, who donated his portion to me. Our mains, however, were excellent. 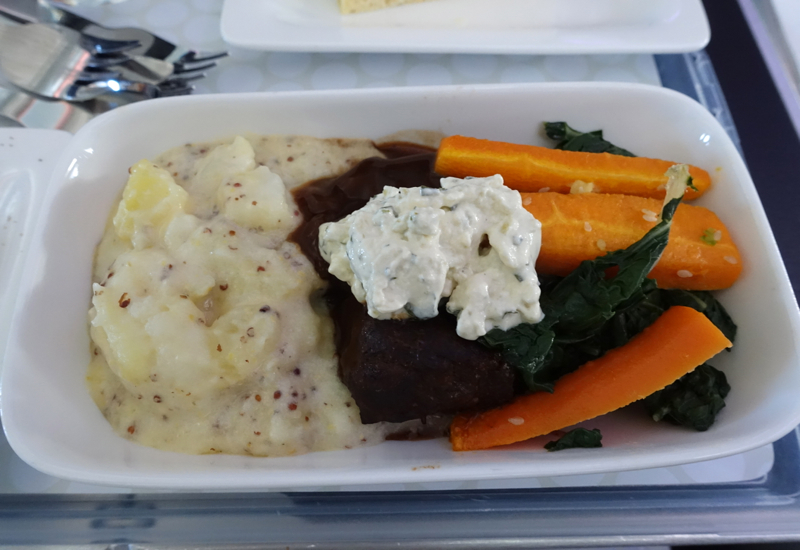 I loved my hearty dish of beef cheek cooked in stout with cauliflower and potato gratin, honey carrots and mustard relish. Very satisfying. As delicious as my dish was, I liked my son's even more: prosciutto wrapped chicken with parmesan polenta, zucchini, spinach and salsa rosa. My son liked it too, but it was such a generous portion that even he, with his usually adult-sized appetite, couldn't finish it. The dessert though, I have to agree with my husband, was not so good. Partly because white chocolate, at least to me, rarely is the basis of inspiring desserts, and partly the execution just fell flat. Presentation was fine, but it was too processed tasting. 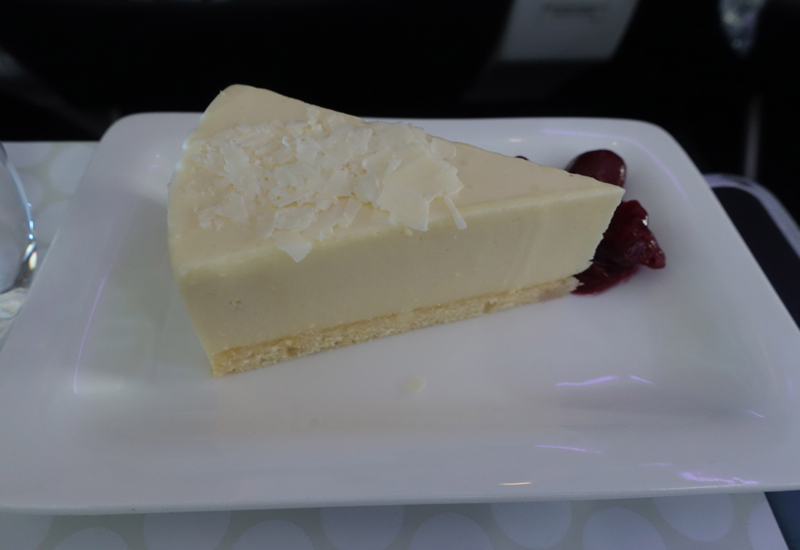 The cherry compote was quite nice, although I think a better option would have been sour cherries, since the cheesecake was already cloying in its sweetness. 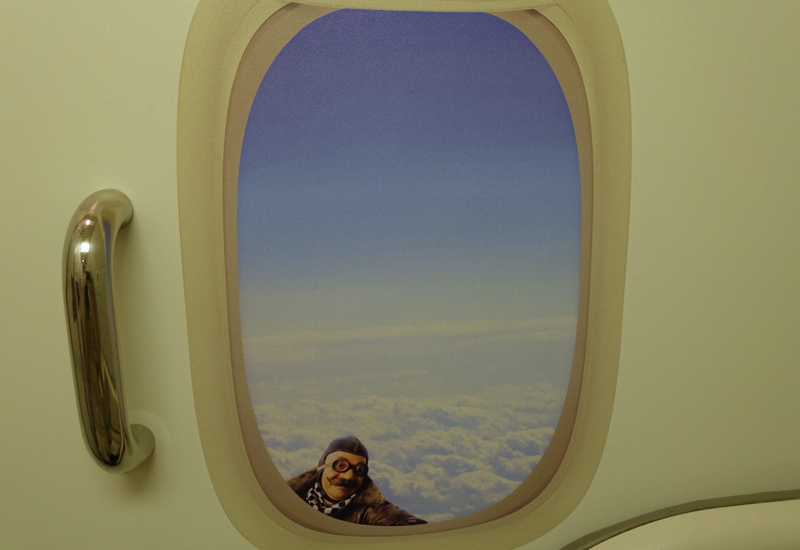 I don't know about you, but this may just be my favorite Air New Zealand safety video ever. I know nothing about surfing (despite being from Hawaii–even my 7 year old was better than me for our first surfing lesson ever at the Four Seasons Maldives at Kuda Huraa) but this video was so fun and uplifting. Not what you usually expect from safety videos! 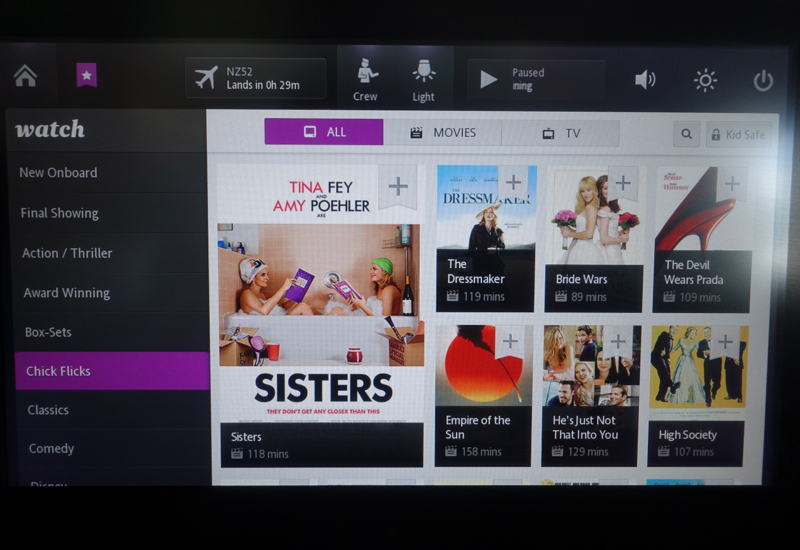 I had to laugh at the movie selection, since there was a category actually called “Chick Flicks.” Perhaps I'm just not looking at other airlines' film categories closely enough, but this is the first time I've seen an airline IFE system actually label a category that way. Also not sure why Steven Spielberg's Empire of the Sun is necessarily a chick flick, but I digress. 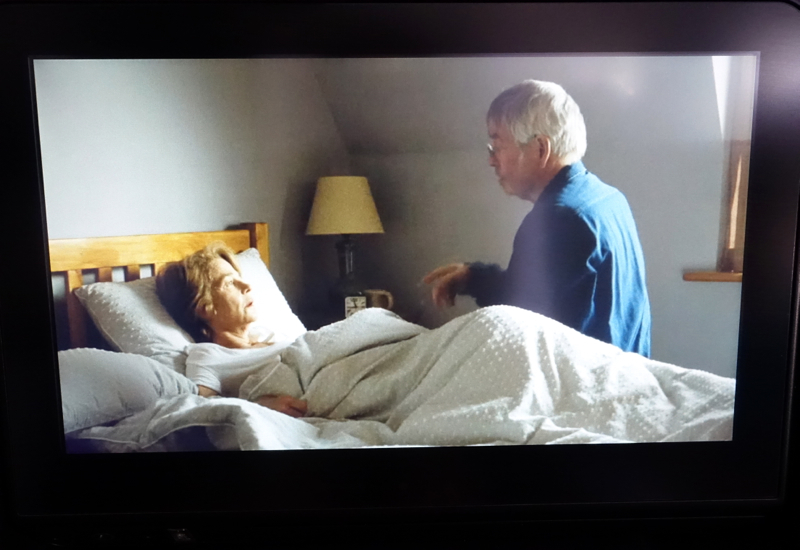 And I chose the drama “45 Years” with Charlotte Rampling and Tom Courtney, based on the short story “In Another Country” by David Constantine. Superb performances by Rampling and Courtney: I highly recommend it if you haven't yet seen it. 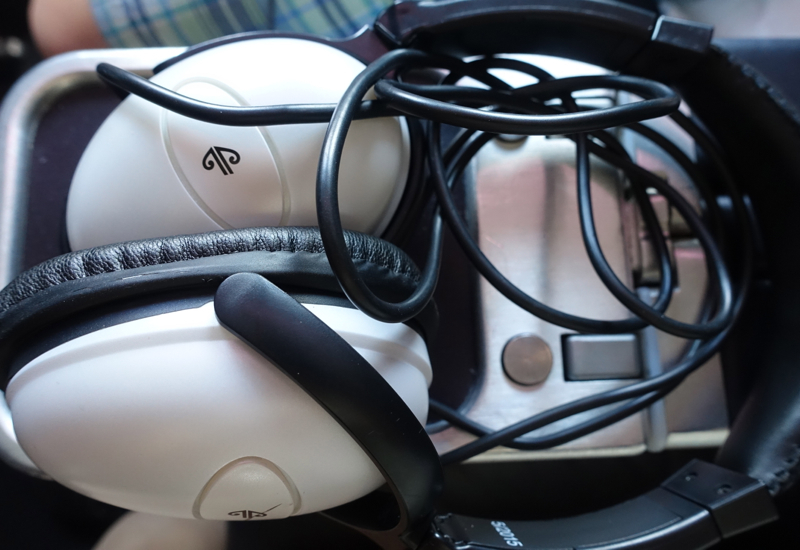 We had a superb Air New Zealand Premium Economy experience, in a product that really differentiates itself from Economy and Business Premier. 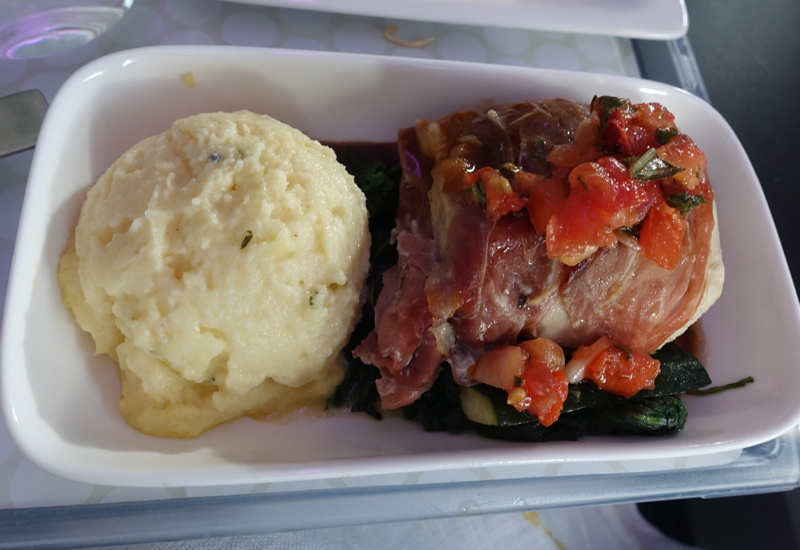 The seat has a good amount of leg room and foot rest support, the service was fantastic–the friendliest I've enjoyed in any type of Economy or Premium Economy class–and our main dishes were excellent, even though dessert was not so good. 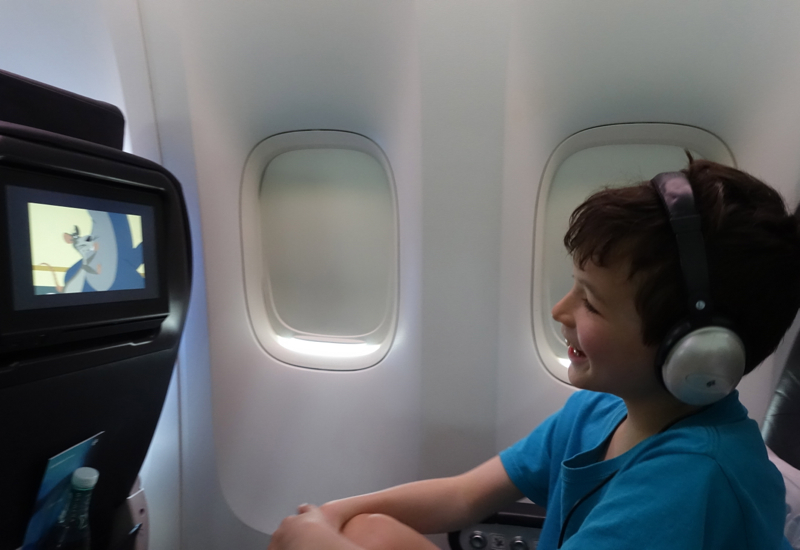 Plenty of airlines have great IFE systems, but we liked Air New Zealand's offering, and the safety video brought a smile to our face. The caveat, of course, is that we were on a short flight. 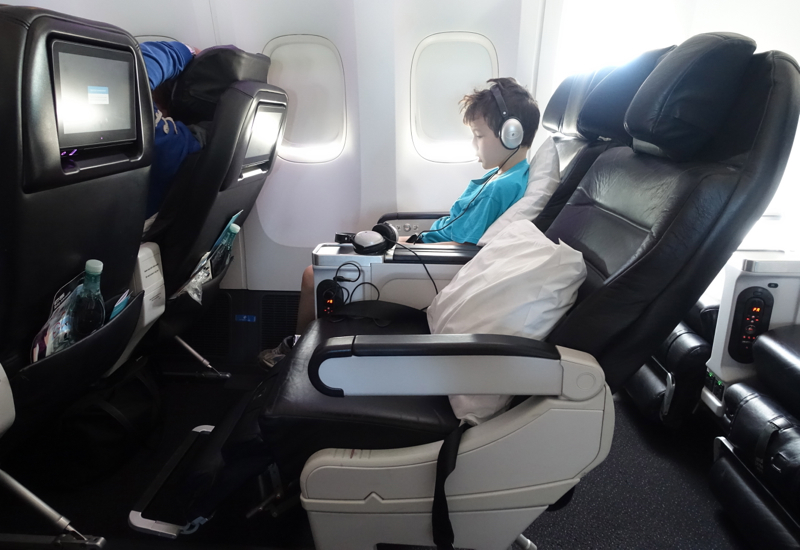 For a long flight or night flight, there's no question I'd still want to be in Business Premier for the flat bed seat. Become a TravelSort Client and Book Your Hotel with Virtuoso or Four Seasons Preferred Partner Benefits!